This thesis was developed to numerically evaluate the ratcheting performance of pearlitic rail steel grades under different service loading conditions. Utilising a systematic experimental program, the modeled ratcheting behavior was compared against in-service performance of the studied rail steels, and was found to have a reasonable correlation.This reveals that the developed approach has the capacity to numerically evaluate the performance of other pearlitic rail steels under actual wheel-rail cyclic rolling contact conditions. The results obtained in this study can provide useful information to the railway operator(s) for the development of a reliable and cost-effective maintenance strategy for a specific track. 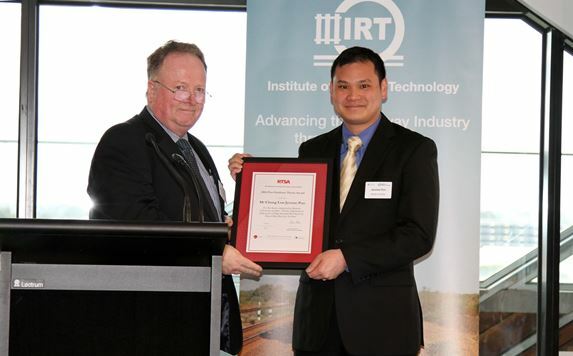 Dr. Jerome Pun accepting the Post Graduate Thesis Award from Phillip Campbell OAM, Executive Chair of the RTSA in Melbourne, 2016. This thesis presents a detailed simulation methodology for calculation of locomotive traction forces, along with a theoretical and numerical investigation for a wide variety of scenarios relevant to Australian practices. High-adhesion AC-drive freight locomotives can exert 50% more traction force for a given locomotive weight in comparison to older DC-drive units. Despite this, their adoption is being delayed by a lack of understanding of the effects of (increased) locomotive traction forces on track infrastructure. This thesis presents a methodology for modelling locomotives as complex mechatronic systems so that wheel-rail forces and dynamic behaviour for locomotives under traction can be simulated in detail. Andrew George accepting the Post Graduate Thesis Runner-Up Award from Phillip Campbell OAM, Executive Chair of the RTSA in Melbourne, 2016.